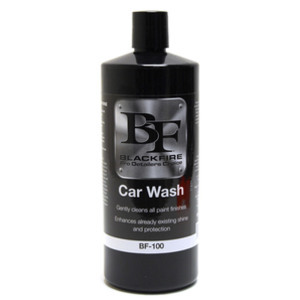 Blackfire Car Wash gently cleans all paint finishes and enhances existing protection. This car wash is highly concentrated and is pH balanced meaning it won’t strip any existing waxes or sealants. Blackfire Car Wash is one of the most advanced car wash products on the market. It contains Tuff Suds II technology that creates mountains of suds to help remove dirt and grime without scratching the surface. It also contains tri-polymers that replenish and reinforce existing paint protection that is on your vehicle. These tri-polymers also increase water beading. 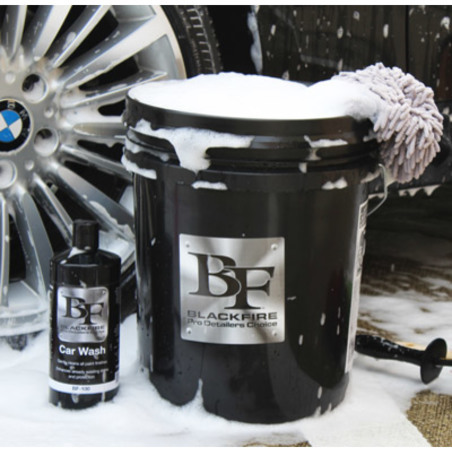 The natural conditioning agents included in Blackfire Car Wash leave paint shiny and slick. Work out of direct sunlight. Dilute 1 ounce of shampoo in 3 gallons of water. Activate foam with a jet of water. Use a clean wash mitt or sponge to wash the vehicle, starting at the top. Rinse frequently. Do not allow shampoo to dry on the vehicle. Dry the vehicle with a drying towel to prevent water spots.